Cycling your starter during long breaks between bread baking can lead to excess starter if its not used in some way. Some people like to give some away to friends, but others like to put it to other good uses. As one of our Bread Boss testers said he would rather make pancakes than discard a portion of his starter when not making bread. Great idea!! Enjoy these delicious sourdough pancakes with fresh cream, blueberries, raspberries, bananas and maple syrup. The sourdough stage requires a dough temperature 20°C (68°F). Just a note on the flour type. The best result is gained with an ‘all purpose’ flour. Here in Australia this is usually a lower protein flour, typically with a protein content of around 8%. This flour is usually found in supermarkets. 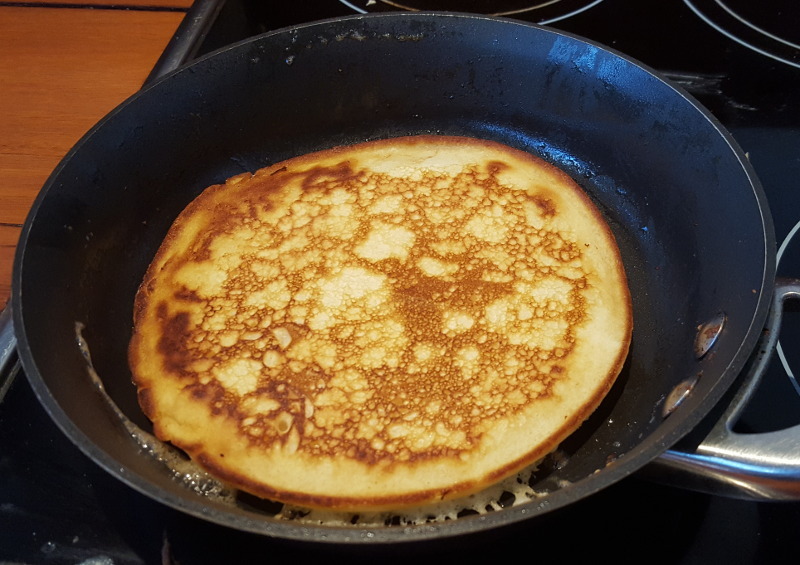 The reason for this is that a high protein flour used for bread making will not produce a pancake with a tender texture as a lower protein flour. Making the pancake batter means blending the ingredients without achieving gluten bonding. So we err on the side of mixing only as much as needed to blend it all together, nothing more. 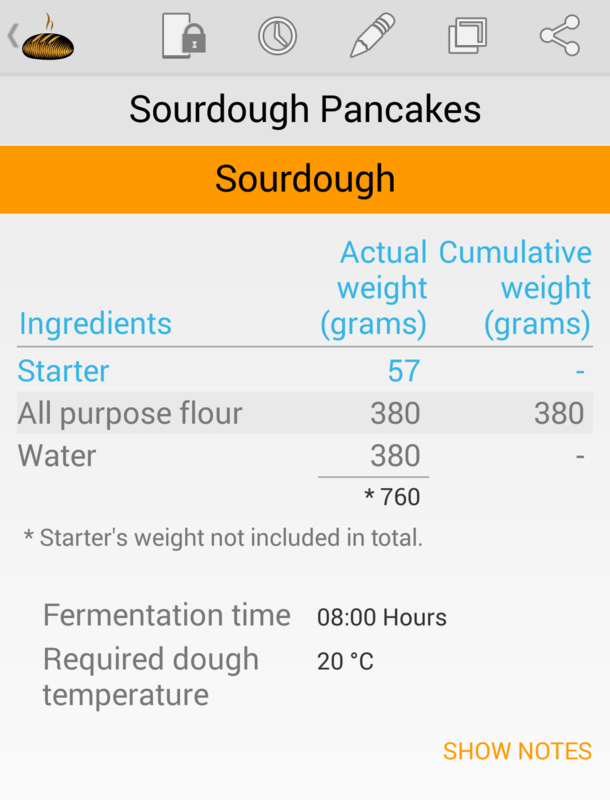 Sourdough stage in Bread Boss app. 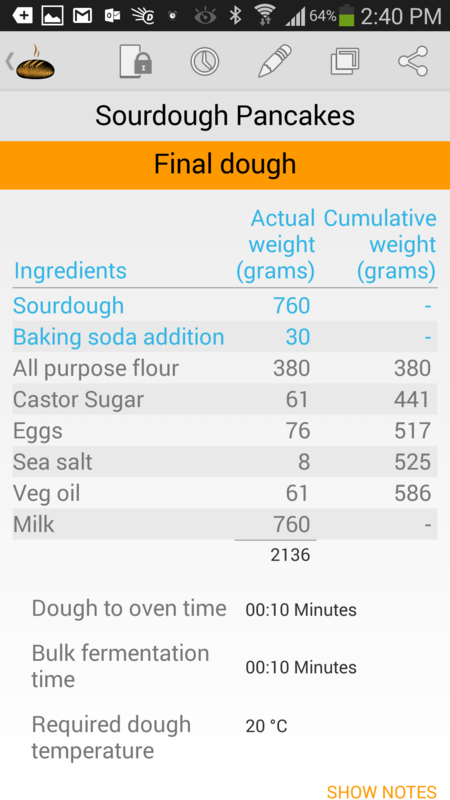 The sourdough created in this stage will be 57g (2.011oz) more than is required in the final dough. This amount could be removed from the sourdough stage before adding it to the final dough and will be your starter for the next time you make pancakes. Remove the starter amount from the sourdough and save in refrigerator for future batches of pancakes. Add all of the ingredients to the sourdough. Add the milk and mix to create a thick batter. Allow to stand for 5 to 10 minutes. Mix together the baking soda and water and leave for a couple of minutes. 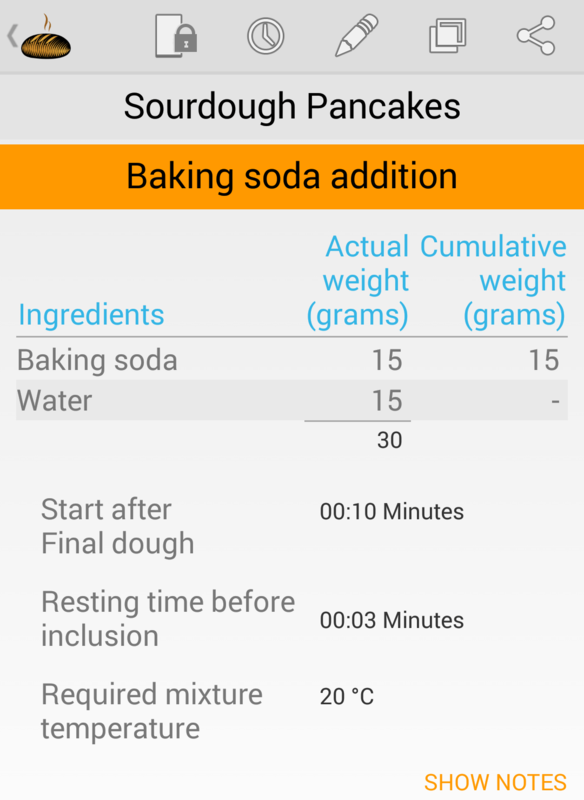 Mix through final dough (batter) just before you start cooking the pancakes. Add butter to skillet and cook each pancake for about 4 minutes on one side until bubbles form on top and then flip and cook until golden. Adding baking soda at the very end or just before cooking is to capitalise on the acid – alkali reaction which occurs between the sourdough acids and the baking soda. We prefer the carbon dioxide to be generated in the pan during cooking, not before. This will ensure a lighter aerated pancake. It’s true that heat accelerates the reaction but we want as much gas as possible generated during the cooking stage, so we wait until we are ready to cook! !